This is a BatteryStuff best pick. One of the most feature-filled, versatile units we carry, and priced well below suggested retail! BatteryMINDer Model 128CEC1: Don’t just charge your batteries...Condition them! The most advanced series of Battery Charger-Maintainer-Desulfators that BatteryMINDer has every offered using SmarTECHnology™. Users can now determine the level of charge remaining in their battery, and if weak and in need of replacement, before going bad. In addition, units test for weak cells and will recover weak or severely discharged batteries that other chargers would reject. Battery MINDer is highly recommended for batteries that have been neglected and abused. Each Battery MINDer ships with one quick disconnect ring set and alligator clips. The Battery MINDer does have an ambient temperature sensor on the unit. The optional Battery MINDer Temperature Probe Extention Cable is available for purchase, and enables the charger to sense the temperature of the battery. Due to the different battery type setting the output voltages will vary depending on the battery type you select. 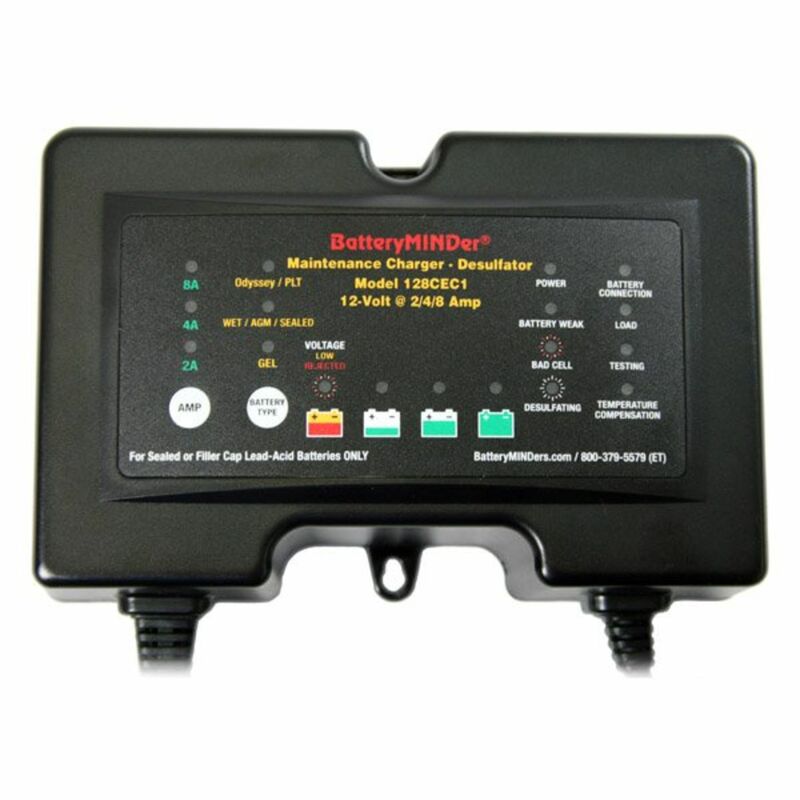 The BatteryMINDer is one of the most advanced battery chargers on the market today. BATMINDprobe Battery Minder Extension Cable Temperature Probe is designed to attach to the battery and monitor the battery temperature. Battery Minder will adjust the charger voltage to protect against overcharge and undercharge during temperature extremes. 210-AY Use in conjunction with BatteryMINDer® units designed to maintain multiple batteries. Do you own the 128CEC1? Please, tell us what you think about it. It helps us provide you with better products. Please note that it may take up to 72 hours for your review to appear. Pros: This is an excellent battery charger in my experience with numerous brands/models of "electronic" pulse/desulfating type chargers. I have tested other brands of pulse style chargers and the battery maintenance voltage was not correct for the various types of batteries, i.e. flooded cell, Gel, AGM - which all require a different maintenance voltage to be 100% charged without being over-charged. By using a lower voltage than the proper maintenance voltage required these other chargers never fully charged the battery. 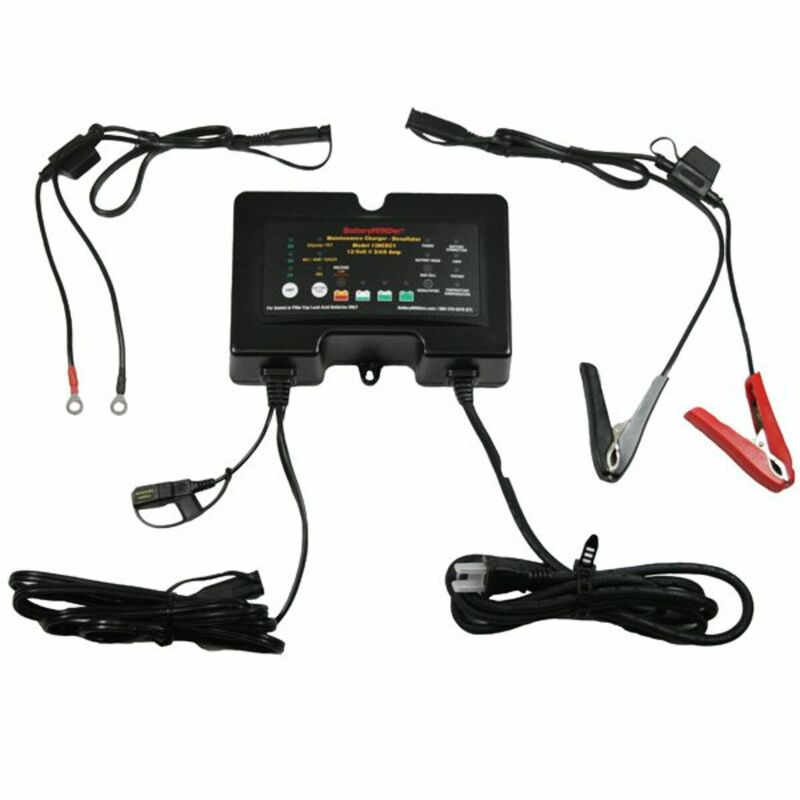 The BatteryMinder 128CEC1 performs properly at the correct maintenance voltages for all three battery types. In addition this charger comes with a temperature sensor to adjust the voltage based on ambient temp - which is important or the battery may not be fully charged or over-charged. BatteryMinder also offers special models of this charger for Odyssey, Gill and Concord batteries which require different maintenance voltages. Cons: The quality seems excellent but these chargers are pricey IMO. No doubt this is a reflection of the charger's performance and consumer demand for quality products. IMO this is a perfect example of getting what you pay for so while pricey I have bought several of these 128CEC1 model BatteryMinder chargers because I need reliable charging/maintenance on expensive AGM and flooded cell batteries in classic/unique cars. These chargers come with an excellent warranty though you probably won't need it. If you do however it's nice to know that you have a 5 year warranty. The ring terminal accessory is useful for vehicles that need to be quickly and conveniently connected to the charger. After testing other brands of pulse/desulfating type battery chargers the BatteryMinder 128CEC1 proved to be the only model worthy of consideration due to the shortcomings of the other brands that I personally tested. Pros: Now whether or not the charging algorithm does chemically desulfate the battery or not is still up in the air for me (this is some seriously advanced electro-chemistry and the effectiveness is debatable). I have done some brute force desulfating with good results using an adjustable DC power supply but it requires constant monitoring. However, I have checked this bad boy out with an O-scope and it does control itself very well and produces the pulses it says it does so at least there's a good implementation of that algorithm. Time will tell if it has restored the battery completely or just topped it up temporarily. Cons: Nothing bad so far. Lot's of good products and information on this site. Thanks!